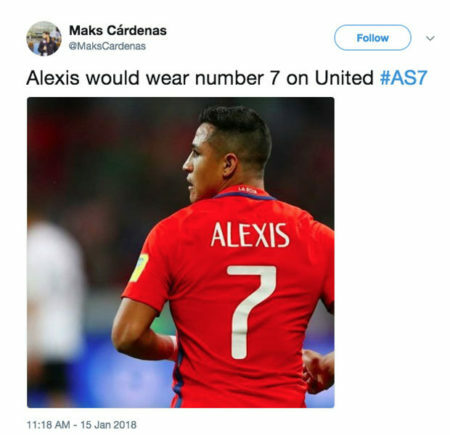 In the history of Manchester United, the number 7 has a symbolic association with club fans as a number of players that shook Old Trafford have worn that jersey. From the likes of George Best to Eric Cantona to David Beckham and Cristiano Ronaldo, marquee players have lit up The Theatre of Dreams with their football artistry. The latest player to join that illustrious list is Alexis Sanchez, the 28-year-old player currently plying his trade for Arsenal. The Gunners are ready to sell the player to United in a player plus cash deal that involves Henrikh Mkhitaryan, a move that is leaving fans purring at the impact he would have at our club. Back in 92, Manchester United manager, Sir Alex Ferguson made the signing of Frenchman, Eric Cantona a priority ahead of the inaugural season of the English Premiership. The player had been fantastic for Leeds United the previous year as they pipped The Red Devils. Despite having a reputation as a hot-headed player, Cantona almost singlehandedly transformed the fortunes of the club. Four league titles followed in five years, Doubles, and the famous incident on a fan at Crystal Palace. He was the model professional who the young players like Ryan Giggs and Paul Scholes emulated. Cantona’s shock retirement in ‘97 did nothing to diminish his legendary status. Sanchez is 29 but is a seasoned campaigner in the Premier League, hungry for success at a bigger club. He was expected to join City but we hijacked the deal and will give him the number 7 jersey. It is hoped he would have the impact Cantona had at the club, as his drive, quality and commitment is sure to spread across the rest of his teammates. Just like Cantona had those years ago, Sanchez is ready to lead the club to a new era. The number 7 is a motivation.